According to a new study reported in the open-access journal PLoS ONE, climate change may have driven the collapse of Eastern Mediterranean civilizations around 1300 – 1200 BC. Hieroglyphic and cuneiform texts portray the proximate cause of the collapse of the late Bronze Age civilizations as the invasions of the Sea Peoples. But the new study says the Eastern Mediterranean cultures suffered wars, famine fuelled by climate change. 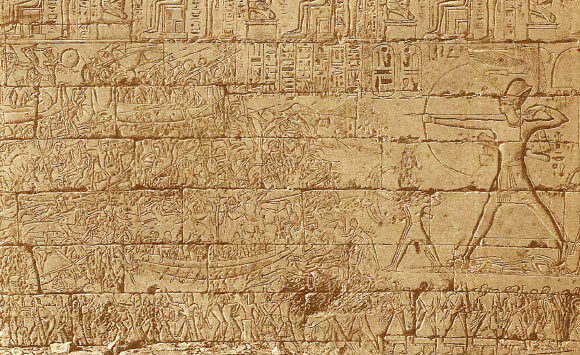 The picture shows Sea Peoples in their ships during the battle with the Egyptians (Drawn by Boudier from a photograph by Beato). Ancient civilizations flourished in regions of the Eastern Mediterranean such as Greece, Syria and neighboring areas, but suffered severe crises that led to their collapse during the late Bronze Age (LBA). In the study, lead author Dr David Kaniewski from the Université Paul Sabatier-Toulouse and his colleagues from Belgium and France studied pollen grains derived from sediments of an ancient lake in the region to uncover a history of environmental changes that likely drove this crisis. As a result, crop failures led to famines, repeated invasions by migrants from neighboring regions and eventually, the political and economic collapse of the Eastern Mediterranean civilizations. Combining new data with archeological evidence from cuneiform tablets and correspondence between kings, the team suggests that the late Bronze Age crisis was a complex, single event comprised of climate change-induced drought, famines, the Sea People invasions and political struggles, rather than a series of unrelated events. 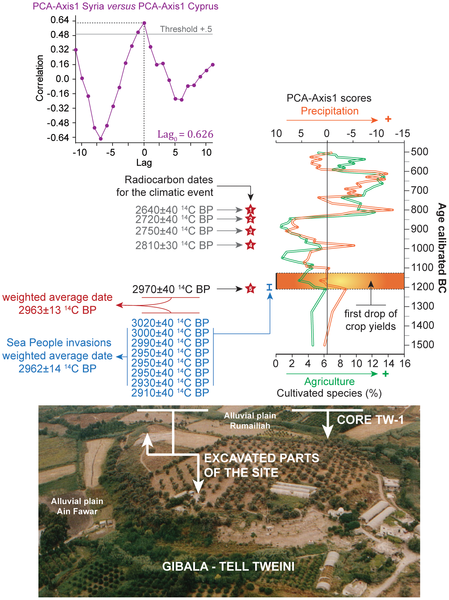 “By combining data from coastal Cyprus and coastal Syria, this study shows that the LBA crisis coincided with the onset of a 300-year drought event 3200 years ago. This climate shift caused crop failures, dearth and famine, which precipitated or hastened socio-economic crises and forced regional human migrations at the end of the LBA in the Eastern Mediterranean and southwest Asia,” the scientists explained in the paper. They conclude that this event underlines the sensitivity of these agriculture-based societies to climate, and demystifies the crisis that led to their end. Figure 6. Radiocarbon-based archaeology, climate and agricultural productivity from Gibala-Tell Tweini, Northwest Syria.